Just as the gloom was starting to set in from the real estate slowdown came the announcement that Amazon was opening an office here that would employ 5,000 people making an average salary of $150,000. Mike Nichols, a past president of the Greater Nashville Realtors, says that the level of income from the Amazon people will benefit the upper-end market, especially the downtown condos. AllianceBernstein had announced earlier this year it was moving here with 1,000 jobs. To put that into some perspective, Nissan projected 1,300 new jobs when it announced in 2005 it was relocating its headquarters here. It now occupies an enormous building in Cool Springs visible from I-65. One lesson learned from the Nissan relocation was that some of the employees loved working at Nissan but loved living in California even more. And many chose not to relocate to the area, as has been the case with several other companies relocating here. As the news from Amazon’s announcement began to be absorbed, Gov. Bill Haslam, a man who knows not the meaning of lame duck, and his commissioner of economic and community development, Bobby Rolfe, delivered more startling news: Ernst and Young will be opening a Music Row office with 600 more jobs. By the way, Pulaski has a population of approximately 8,000 people – total. And the roles of Nashville Mayor David Briley and Matthew Wiltshire, the mayor’s director of Economic and Community Development, should not be overlooked. Wiltshire has held his position for three mayors, all of whom had distinctly different goals, personalities and philosophies. What Wiltshire has accomplished is unsurpassed, and there will come a time when the city will look back in wonderment at what happened during the period he held this position. Nashville’s residential real estate market, meanwhile, is somewhat of a paradox, as sales are declining, inventory is building and yet prices continue to rise, all while the area is coming off a record year in 2018 and is only 1 percent off that exhaustive pace. Sher Powers, president of Greater Nashville Realtors, notes inventory is growing at a torrid rate with the number of condominiums on the market doubling since October of last year. That’s great news for buyers who will be able to make sound buying choices over the winter months. Many in the community have expressed glee to local residential real estate agents for the jobs that are migrating into the city. However, Nashville Yards, the future home of Amazon, remains a rather large hole at this time. The early winners in this situation are the owners of apartments, which are teeming in vacancies, and the construction firms. Someone has to build the $230 million development, and that project alone will provide thousands of jobs. Many of those workers will be driving – I repeat driving – into town from outlying areas. Amazon is expected to start hiring next year, though the move will not be completed for several years, and a large portion of the workforce, 50 percent most likely, will choose to rent. Many will decide to live downtown – thankfully and hopefully – as the traffic issue looms large and dangerous. It must be addressed through leadership rather than referendum. We know this much. If we build it, they will come. OK, if we build it and give them $102 million, they will come. And they are bringing jobs and people with them. When the 5,000 Amazon people arrive earning $150,000 each year, their salaries will add up to $750 million a year. Surely the taxes on that income will fund a train or a bus or two. Grant Hammond and Casey Zolezzi are well known for selling new construction in the downtown area and have amassed hundreds of transactions over the years. 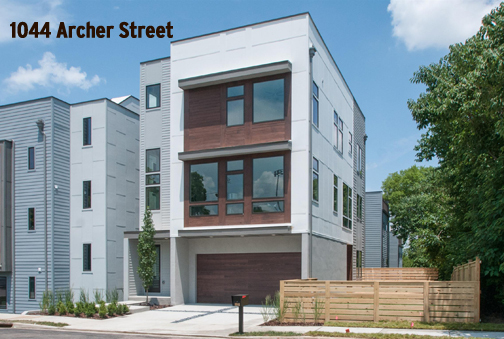 Last week, Nashville’s urban legends Hammond and Zolezzi teamed to sell 1044 Archer Street for a whopping $1 million. Three years ago, Archer was a sleepy, secluded street with small 1,500-square-foot houses resting in the shadows of The Gulch and its 1212 and Icon condos. Given the location, new construction selling for $285 per square foot is considered a bargain, especially if it houses four bedrooms – two of the master suite variety – and three full bathrooms with a half bath thrown in. In addition, he describes the kitchen as huge, “with professional appliances.” A $1 million kitchen is no place for amateurs. In another prescient moment, Hammond introduces a stellar representation of the roof, stating that it was a “full Bostonian roof terrace with city views,” a term sure to excite the chowderheads on their searches of Nashville properties. Although Casey is a name synonymous with baseball, Casey Zolezzi never strikes out when dealing with new residential construction. As was the case with the Archer sale, Zolezzi’s clients once again were the recipients of programmable thermostats, a fireplace, Energy Star windows and a tankless water heater. As he penned his remarks, Hammond noted this listing is “magazine worthy,” perhaps to trick a search engine into thinking it was featured in a magazine or to lure a magazine writer into the site. While The Ledger is not a magazine, we felt it was worthy of this piece at least. Richard Courtney is a licensed real estate broker with Christianson, Patterson, Courtney, and Associates and can be reached at richard@richardcourthey.com.